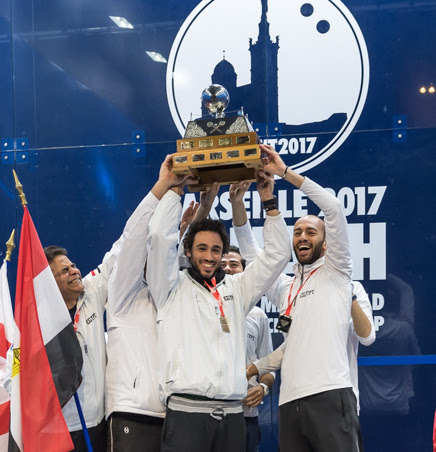 Favourites Egypt defeated defending champions England in the final of the WSF Men’s World Team Squash Championship at Salle Vallier in Marseille to reclaim the World Squash Federation title they lost to England four years ago in Mulhouse, also in France. England reached the final for the ninth time since 1983 in comfortable style and presented a line-up for the final boasting three players with more than 300 international caps between them – probably the most experienced team ever to represent the country in the 50 years of the tournament! By contrast the four-man Egyptian squad only included one player who had ever competed in the championship before – yet the three-man team in the final all had rankings within the world top five! 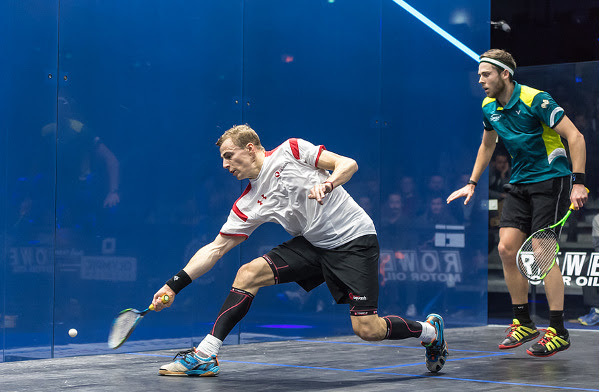 With the agreed playing order being 1, 2, 3, title-holders England presented three-time world champion Nick Matthew, the 37-year-old world No.6 appearing in the event for the seventh time since 2003, to face 26-year-old world No.4 Karim Abdel Gawad, a championship debutant. Matthew was clearly not the player who despatched Australian number one Ryan Cuskelly in straight games just 24 hours earlier. The Yorkshireman was forced to take a three-minute ‘self-inflicted injury break’ midway through the second game – and it later transpired that he had suffered a minor recurrence of his old ankle injury during the warm-up for the match. After just 34 minutes, Egypt took the lead when Gawad (pictured above with Matthew) claimed an 11-9, 11-3, 11-7 victory. 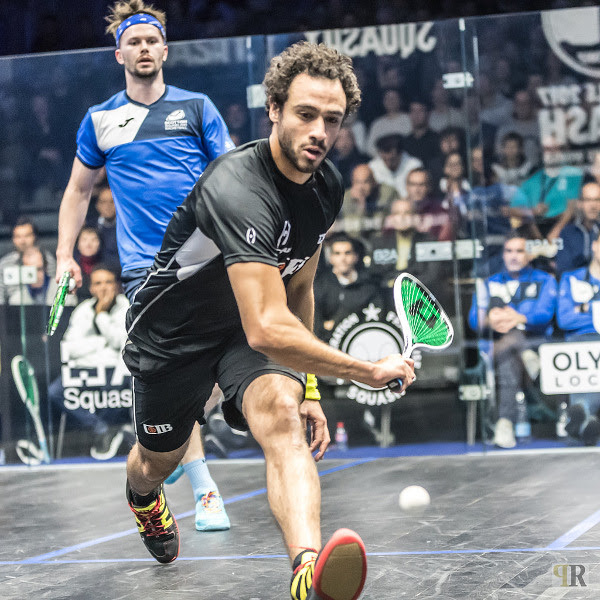 Egyptian number two Ali Farag was also making his debut in the final – while English opponent James Willstrop was not only celebrating his fifth successive World Team Championship battle against an Egyptian opponent since 2003, but also his 156th cap for his country. 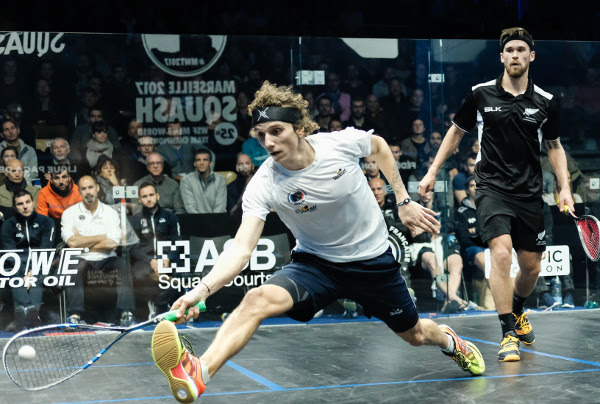 Former world number one Willstrop, 34, did what he could to keep his 24-year-old opponent at bay – but Farag was clearly on a mission and after 36 minutes clasped his face in his hands as he celebrated his championship-winning 11-5, 11-9, 11-5 triumph. 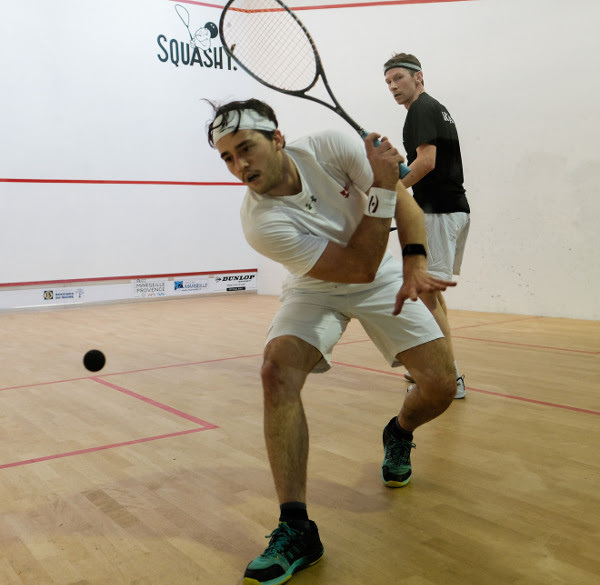 “The word big is an understatement – it is much bigger than big!” gushed Farag (pictured below in action with Willstrop) when asked to comment on the significance of the win. 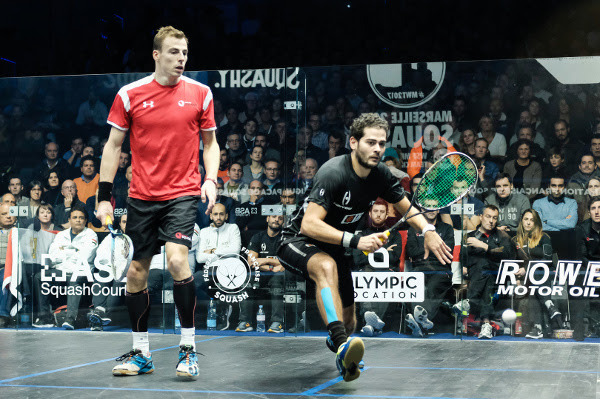 “I felt I had the whole Egyptian squash community on my shoulders. I wanted to make them proud. “Four years ago, I was still at college. I remember watching the final – it was a dream of mine to wear the Egyptian shirt. When it was pointed out that Egypt had the luxury of not playing their fourth string Ramy Ashour, one of the sport’s greatest names and a three-time world champion, Farag said: “It says a lot about how much he values the team that Ramy, our captain, was happy to leave the team selection to our coach and not play tonight. Nick Matthew had much praise for England’s successors: “They were quality opponents tonight – especially Ali against James. “We knew we had the experience and we hoped that would carry us through, but I didn’t quite get into the match. “We felt we had more to give. We were playing guys at the pinnacle of their careers. We wanted to push them to their absolute limits – we knew we had the best opportunity now before they dominate for perhaps the next decade. On his injury, Matthew explained: “It was in January 2015 that I was told I needed surgery on my ankle – as a result of which I changed my whole life around: I changed everything on the back of that – my training, my diet, my playing. “The way I played in the semis against Australia was some of the best squash I’ve played this season. But I felt a twinge during the warm up. The manner of my defeat gave them the momentum going into the second match. Success in Marseille means that Egypt now have all the men’s and women’s, senior and junior, team and individual WSF and PSA world titles – EXCEPT the Men’s Junior World Team title, in which final in 2016 the country narrowly lost to Pakistan! After their shock quarter-final exit to Hong Kong China, hosts France – the third seeds – beat New Zealand in the play-off for fifth place earlier today on the all-glass showcourt at Salle Vallier. Third string Lucas Serme clinched victory in the decider, beating Kiwi Evan Williams (both pictured below). “If someone had told me we’d be playing on finals day I would have been delighted,” said French national coach Renan Lavigne. “But not to play for fifth place! “It’s not we’d been working for. But I thought Hong Kong dealt with the situation on Friday better than we did and you have to hand that to them. My guys gave everything they had. “The last two days have been the toughest for me over the past five years. We’ve been looking at everything, including what we need to do to improve. “We deliberately rested Greg (Gaultier) today to give the rest of the team the responsibility, and they did what we wanted – and even though Marche lost, he showed great strength and got a bit of confidence back. One of the first positions to be decided amongst the 24 teams was the one for 23rd place – won in impressive style, against the odds, by Iraq, the 24th seeds making their debut in the event. With 45-year-old Rodney Durbach in the squad, 22nd seeds South Africa ended up in a creditable 18th place after losing 2/0 to 18th seeds Argentina in the play-off for 17th place. Durbach, his country’s most capped player, endured his third successive five-game battle, this time narrowly going down 7-11, 12-10, 9-11, 14-12, 11-9. Despite team number one Borja Golan being unavailable for the last three days due to injury, 12th seeds Spain ended in 11th place to record their highest finish ever in 13 appearances since 1985. Scotland also achieved their best finish since 2003 after taking 8th place. 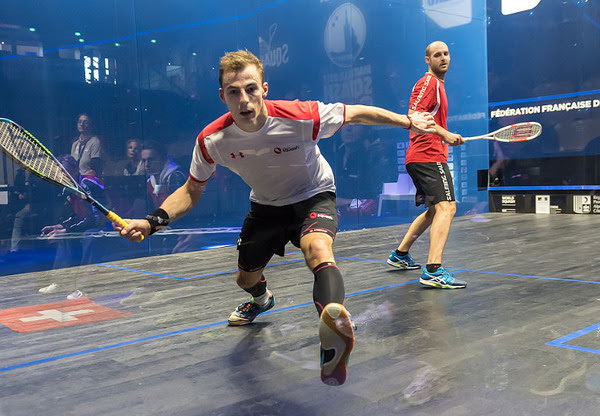 Defending champions England and top seeds Egypt will contest the final of the WSF Men’s World Team Squash Championship for the third time in a row after prevailing in the semi-finals of the biennial World Squash Federation event in Marseille without dropping a match. England, the second seeds, overcame arch-rivals Australia 3/0 while favourites Egypt saw off surprise semi-finalists Hong Kong China – the fifth seeds who shocked hosts France in the quarter-finals. Despite the absence of the home side, the packed crowd at Salle Vallier fully engaged with the teams on show – particularly throwing themselves behind underdogs Hong Kong in their battle with Egypt. The victory over perennial rivals Australia saw England secure a place in the final for the ninth time since 1983. The two countries have won the title 13 times between them – and were clashing in the championship for the 12th time since 1983, with England narrowly ahead 6-5 before today’s encounter. 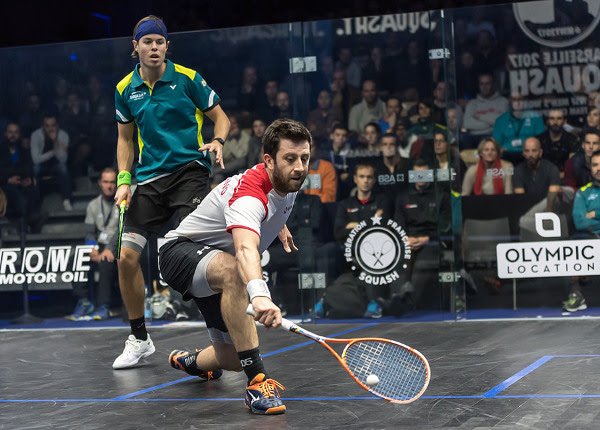 The teams’ third strings took to the court for the opening match – with Aussie underdog Zac Alexander, ranked 126 in the world, facing world No.15 Daryl Selby (both pictured above). It was the pair’s first meeting and Alexander saved a game ball in the first game before taking the lead 12-10. But Selby soon stamped his authority on the match, taking the next three games 11-7, 11-5, 11-7 to give England the lead. Aussie No.1 Ryan Cuskelly came into the second match after being taken to five games in a gruelling 97-minute encounter with Kiwi Paul Collthe night before. The New South Welshman faced Nick Matthew, the three-time world champion whom he had never beaten in four meetings in seven years. World No.6 Matthew delivered a masterclass in consistent squash to beat Cuskelly, ranked eight places lower, 11-8, 11-6, 11-4 (both pictured above) to clinch England’s place in the final. 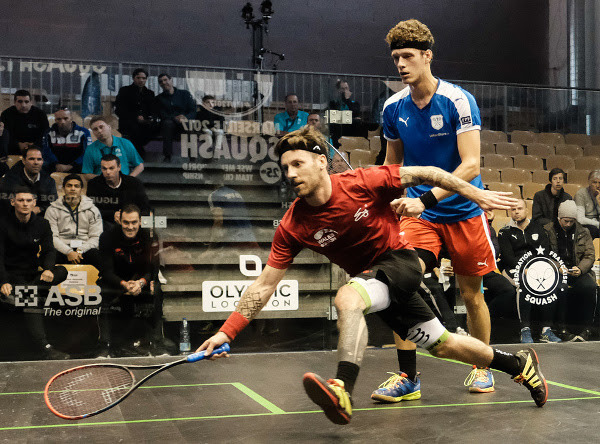 In the best-of-three dead rubber which gave England maximum points, world No.10 James Willstrop – playing in his third successive world championship battle against Australia since 2007 – defeated Cameron Pilley 12-10, 11-6. England team coach David Campion was impressed with Alexander. “He led throughout most of the first game and it was only in third game that you could see that Daryl was getting to him. “Nick had a plan in his match and it worked. The Hong Kong players who lined up for the semi-final were the three stalwarts who silenced the crowd 24 hours earlier by denying the hosts a crack at the title – and consigned France to the lowest finish in the event for at least 16 years. In the opening match, Egypt’s world No.5 Marwan Elshorbagy dropped a game before prevailing 11-3, 8-11, 11-4, 11-7 over the Hong Kong No.3 Yip Tsz Fung (both pictured above). 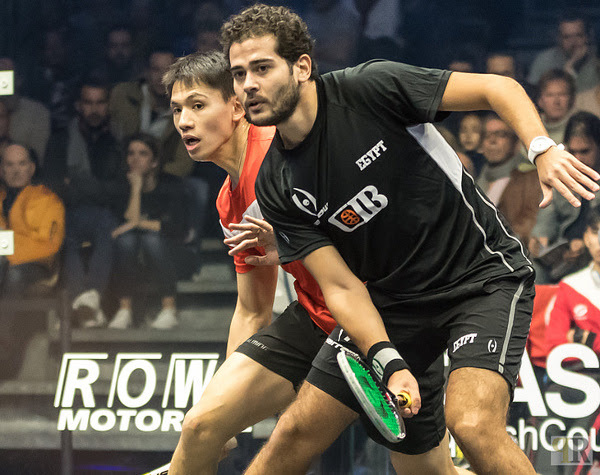 The second match went the full distance – Egypt’s reigning world champion Karim Abdel Gawad twice having to contend with fightbacks from Max Lee before beating his HK opponent (both pictured below) 11-9, 7-11, 12-10, 7-11, 11-7 in 67 minutes. Recently-appointed Egyptian national coach Ashraf Hanafi admitted afterwards: “That was hard – I have full respect for Hong Kong. They proved that it wasn’t luck yesterday. They were very tough. Hong Kong national coach Chris Robertson, also a recent appointment, said: “I was very pleased with my team. They played with plenty of attack and no fear. They put in a good performance – particularly Max. I was really happy that they were able to play like this, particularly after last night. “They looked comfortable against Egypt – they were so dynamic, so aggressive so confident. In battles for lower positions, France recovered from the shock of their quarter-final defeat to beat Scotland 2/0 to set up a meeting with New Zealand in the play-off for fifth place. The sixth seeds defeated eighth seeds India 2/1. South African veteran Rodney Durbach, the 45-year-old who is marking his ninth appearance in the championships since making his debut 22 years ago in 1995, wound back the clock to survive his second successive five-game marathon to lead his country into the play-off for 17th place. South Africa beat 17th seeds Pakistan 2/1 and, seeded 22, will finish well ahead of their seeding. 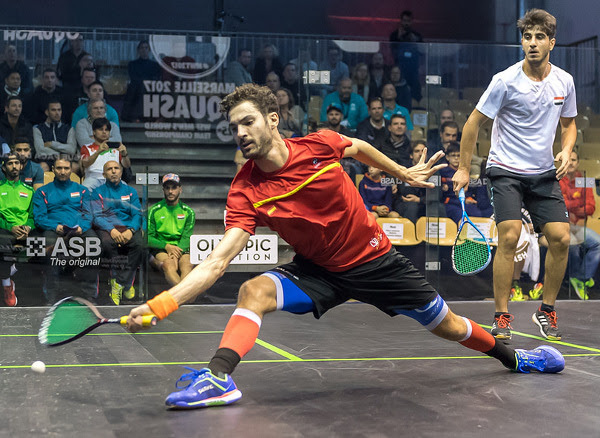 Hong Kong China relegated France to their lowest finish in the WSF Men’s World Team Squash Championship for at least 16 years after upsetting the hosts in the quarter-finals of the biennial World Squash Federation event in front of a capacity French crowd at Salle Vallier in Marseille. 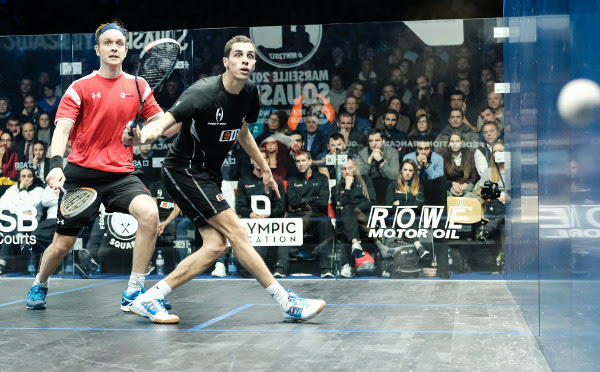 The third seeds, led by world No.1 Gregory Gaultier, were expected to survive this early encounter en-route to reaching their predicted place in the semi-finals, before then fully exploiting home advantage in Sunday’s final by winning the title for the first time. Hong Kong were the fifth seeds – bidding to achieve their highest ever position since finishing in 8th place in 2003. Gaultier was in his usual defiant form as he put France ahead with his fourth successive straight games win in the championship. The match against the Hong Kong number one Max Lee, however, ended in controversial circumstances when, some 10 minutes after winning match ball at 10-9, he and Lee returned to the court to play out the finish again after it was realised that the referee had miscalled the score at 9-8 when it was in fact eight-all. The crowd went silent when Lee moved ahead to game ball at 11-10 – but the French ‘General’ was in no mood to drop his first game of the tournament and snatched the next three points to close out the match 11-6, 11-5, 13-11 to wild applause from the partisan crowd. After celebrating this early lead, the crowd was silenced again when Hong Kong drew level when third string Yip Tsz Fung fought back from 2/1 down to beat France’s world No.27 Mathieu Castagnet 11-7, 7-11, 9-11, 11-2, 11-4 in 67 minutes. The decider had the crowd on the edges of their seats – with home favourite Gregoire Marche facing four-time Hong Kong champion Leo Au(both pictured above), with just seven positions between them in the world rankings. It was a nail-biting affair in which Marche wins were greeted by deafening applause and Au successes by silence. After 57 minutes of tense action on the all-glass showcourt it was Au who emerged victorious, winning 11-6, 7-11, 11-8, 11-2 to end the French dream. “It is a very special achievement for Hong Kong,” said 27-year-old Au minutes later. “We put a lot of effort into our preparations for this and really wanted to do well here. Chris Robertson, who only took over the mantle of Hong Kong national coach a few months ago, was understandably delighted with his team’s success: “It all started when Max was 2/0 down in the first match, during which time he had been outplayed by Gaultier. “He then showed a lot of character to take the third game to a tie-break – and, even though he lost, this gave confidence to the rest of the team. “When Tsz Fung was 2/1 down in his match, I said to him that he needed to stay calm and trust his skills – and he kept up the pressure in the fourth and fifth and won. “Leo is in good form and he handled the pressure brilliantly in the decider. Event favourites Egypt, now boasting a squad with three players in the world top five (based on the new December PSA world rankings), cruised into the semis courtesy of a 3/0 win over surprise opponents Scotland, the 10th seeds. Karim Abdel Gawad put the three-time champions into the lead following a 12-10, 11-6, 11-6 win over Alan Clyne. 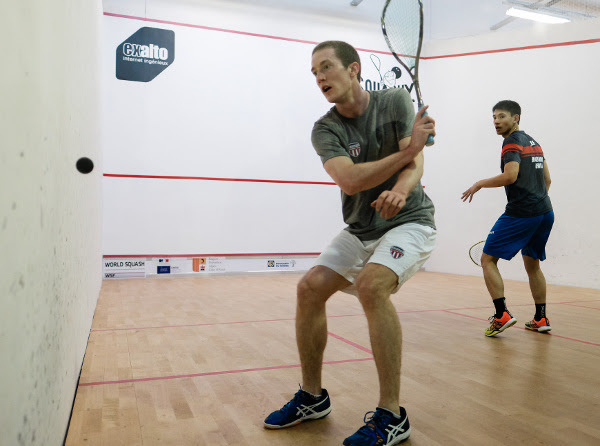 Scot Kevin Moran had few answers to the mercurial skills of the ‘Artist’ that is Ramy Ashour as the former world number one took just 24 minutes to win 11-5, 11-9, 11-4. Egypt national coach Ashraf Hanafi echoed Ashour’s message later: “The most important thing is the team spirit. “If we meet France tomorrow, the pressure will be on us as they will have the crowd behind them. But our players are experienced enough to deal with that. Defending champions England, the No.2 seeds, were the first team to secure a place in the semi-finals – incredibly, the country’s 18th successive appearance in the event’s last four. But the five-times champions were given a hard ride in the opening first string match against eighth seeds India when Saurav Ghosal twice drew level with England’s seasoned campaigner Nick Matthew (both pictured below) and, in the decider, was only points away from his first ever win over the former world number one. When the two players clashed at match ball in the fifth, the referee awarded a let – which Matthew questioned, requesting a ‘video review’. The video review official overruled the decision and awarded the Englishman a stroke, thus putting England ahead after 76 minutes in an 11-6, 6-11, 11-7, 10-12, 11-9 scoreline. It was Matthew’s second five-game battle in a row after the 37-year-old world No.6 staged a mighty recovery from two games down in the last 16 round to beat Swiss number one Nicolas Müller. A consummate 3/0 win by the English number three Daryl Selby over Harinder Pal Singh Sandhu in the second match put England into the semis – and James Willstrop beat Vikram Malhotra in the dead best-of-three rubber to give England maximum points. “Nick wasn’t happy with his performance yesterday but we thought it would serve him well here today,” explained England coach David Campionafterwards. “Saurav played incredibly well today – his recent results have been really good, he is certainly playing above his ranking. Nick had to dig deep today to get through – he is playing on a different level today. “Daryl played a good game – you always know what you’re going to get with him, it was a hard and solid display. “We are not looking to peak too soon here – but we are very ambitious in our aims,” continued Campion. Indian national coach Cyrus Poncha was also full of praise for his number one: “Saurav really outshone himself today – he really worked Nick hard. For his whole life he has been hammered by Nick and today he had a little window! In the fifth game it was neck and neck. England will face Australia after the fourth seeds recovered from a match down to beat Trans Tasman rivals New Zealand. 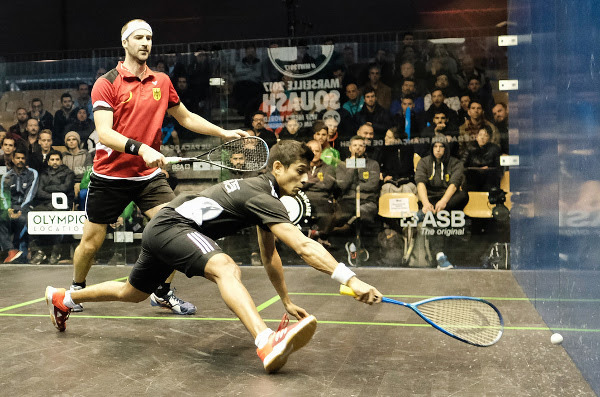 After slumping to a surprise defeat to lower-seeded Malaysia in the qualifying stages of the WSF Men’s World Team Squash Championship, eighth seeds India fought back to ensure a top eight finish in the biennial World Squash Federation event by beating Germany, the No.7 seeds, in the last 16 round at Modern Squash in the French city of Marseille. Germany suffered a setback overnight when squad number two Raphael Kandra, the in-form left-hander ranked at a career-high world No.41, was taken ill. So, with the day’s playing order being 2,1,3, it was the country’s third string Rudi Rohrmuller, an unranked 26-year-old, who took to the court to face India’s world No.61 Vikram Malhotra. Underdogs India duly took the lead when Malhotra beat Rohrmuller 11-8, 11-1, 11-8 in 27 minutes – but in the following battle between top strings Saurav Ghosal and Simon Rösner (both pictured above), it was Rösner who prevailed 9-11, 11-4, 5-11, 11-6, 3-11 in a dramatic 57-minute clash which ebbed and flowed between the two regular PSA World Tour combatants – and saw Germany draw level. India took full advantage of their weakened opponents in the decider when world No.69 Mahesh Mangaonkar defeated Valentin Rapp, ranked more than 200 places lower, 11-6, 11-8, 11-4 to claim victory for the eighth seeds. “I am really relieved,” exclaimed Indian national coach Cyrus Poncha. “There was a lot of pressure on us to make the top eight. “From the start, Vikram was very sound. Saurav was absolutely brilliant. He had his chances – he was outstanding in the first game. In the fifth, Rosner was very solid – Saurav played his heart out. “We knew we couldn’t take any chances in the third match. We didn’t want any mishaps, no easy points – but Mahesh was strong. “Overall, the boys were very down after the loss to Malaysia and we took full advantage of yesterday’s rest day to put in a lot of preparation. The boys were very focussed and very hungry. 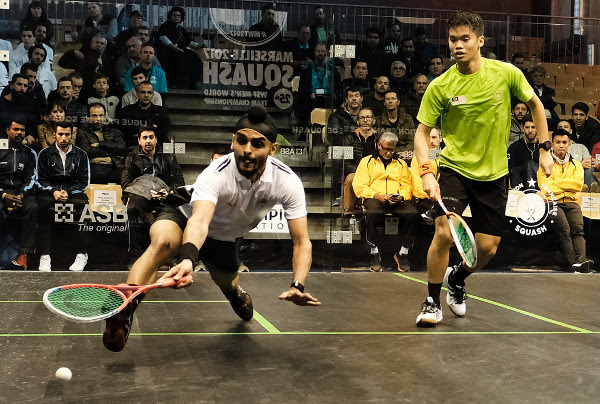 Elsewhere at Modern Squash, another tie went the full distance when fifth seeds Hong Kong China had to recover from the loss of the second match to beat USA 2/1. Hong Kong champion Leo Au put his side ahead after beating former US champion Christopher Gordon in four games. But the 11th seeds bounced back when top string Todd Harrity played the game of his life to see off world No.28 Max Lee 7-11, 11-4, 7-11, 9-11 (both pictured above) and claim perhaps the best scalp of his career. 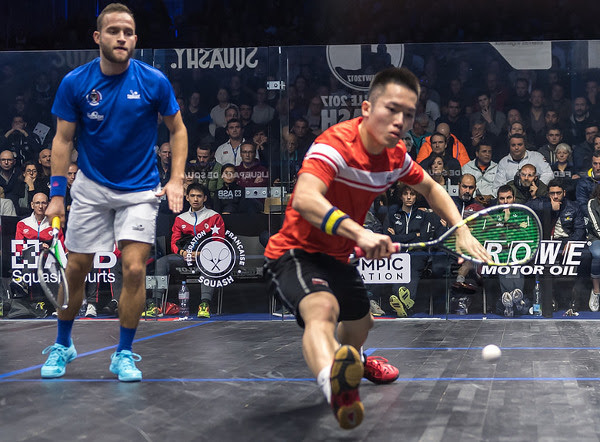 To the delight of his team-mates, Yip Tsz Fung restored order for the fifth seeds to beat Chris Hanson 11-9, 11-7, 11-4 and put Hong Kong into the quarter-finals. “It wasn’t how I predicted it – I thought all my players were in good form,” admitted the new Hong Kong national coach Chris Robertson afterwards. “But it just shows how this team event produces a different atmosphere and different adrenalin. Max was playing a guy who was pretty inspired but Max wasn’t as positive as he has been. The match created a perfect scenario – the favourite struggling against the underdog – and Harrity’s success fuelled the American camp. “But it gave Yip a perfect opportunity to play under pressure – and that was a positive. I wanted to see my players under pressure. “I said to Max, if you were playing on the PSA Tour, you’d be on your way home – but you’re not and tomorrow you could be playing Greg Gaultier. Harrity was more than happy with his contribution to the tie: “I just felt really relaxed today and was up for the match. I got a great start – winning the first game was huge. I didn’t want to let him get on top of me, I wanted to put as much pressure on him as possible. I was really on form and I could see he was edgy. One of the most popular sporting confrontations in the southern hemisphere will take place at Modern on Friday when Australia and New Zealand face each other for a place in the semi-finals. Australia, the No.4 seeds, beat 14th seeds Canada 3/0, while sixth seeds New Zealand defeated 12th seeds Spain 2/1. “The pressure was on us today so it was good to come through,” said Australian team manager Paul Price. “It was also good to be on the glass court for the first time. New Zealand coach Kashif Shuja said: “It’s a big deal for us to make the quarters because we hadn’t reached that stage for more than 20 years. We’ve been working hard for the last three years and are definitely on a high at the moment, so this gives us an extra boost. “We’ve had six amazing days so far here, and the boys are confident and playing well. Yes, it was a very close tie against Spain, but we were expecting this, it’s the World Championship after all! The event’s top three seeds were in action on the all-glass showcourt at Salle Vallier in Marseille. Favourites Egypt comfortably claimed their place in the quarter-finals after beating Finland 3/0, while in the evening tie, hosts France despatched Wales by the same score. 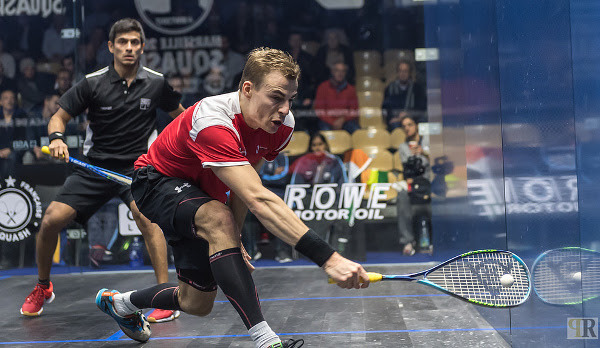 There was drama in the England v Switzerland clash when, after James Willstrop put title-holders England head, team-mate Nick Matthew faced his first ever defeat to Nicolas Müller (both pictured below) when the Swiss number one built up a 2/0 and 8-7 lead and was just three points away from an historic upset. With three world individual titles to his name and more than 100 caps for England, 37-year-old Matthew called upon his vast experience in the game to weather the storm and assert his authority on his opponent to close out the match 9-11, 9-11, 11-8, 11-5, 11-7 in 53 minutes to carry England into the last eight. Back at Modern, day four finished in dramatic style when 10th seeds Scotland fought out a shock 2/1 win over Malaysia, the ninth seeds. 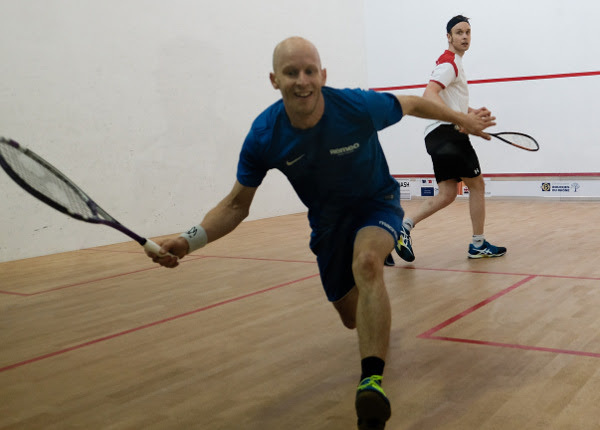 When squad second string Greg Lobban defeated Malaysian Eain Yow Ng (both pictured below) 11-9, 5-11, 11-9, 11-7 and team number one Alan Clyne forged a 2/1 lead over Nafiizwan Adnan, it looked as if Scotland were heading for a straightforward 2/0 upset over their more fancied opponents. But Adnan, who had a superior head-to-head record over the Scot, regained control to overcome Clyne 7-11, 11-1, 11-8, 3-11, 8-11 in 74 minutes. So it was left to the decider for Scotland to clinch victory when third string Douglas Kempsell beat Mohd Syafiq Kamal 11-3, 3-11, 11-5, 10-12, 11-6. “I thought we had it in the second match,” said Scottish team manager Martin Heath. “I was quite confident once Alan went 2/1 up, but Wan (Adnan) played faultless squash in the fourth and fifth games to deny us. “I didn’t know what to expect in the decider – it was always going to be close. 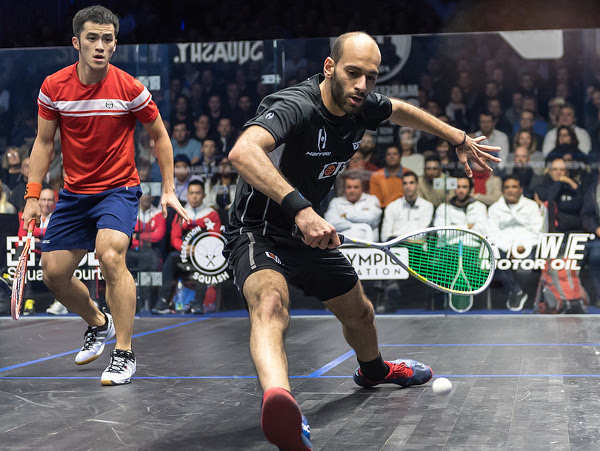 The views of the seedings committee of the WSF Men’s World Team Squash Championship were fully endorsed when the top 16 seeds secured their places in the last 16 knockout stage of the biennial World Squash Federation event at Modern Squash in the French city of Marseille. Spain ended a 28-year absence from the top 16 after beating event newcomers Iraq 3/0 to secure second place in Pool E. With all the players facing each other for the first time, long-time top-ranked Spaniard Borja Golan led the 12th seeds to victory, supported by team-mates Carlos Cornes (pictured below in action against Mohammed Hasan) and Bernat Jaume. “For years we have been relying on Borja but now we have strength in depth with players like Bernat, Carlos and Iker (Pajares Bernabeu) – and others like Edmon (Lopez) who we left at home,” explained Jonas Gornerup, Spain’s team manager. Competing in the event for the first time since 2009, Wales defeated Czech Republic 3/0 to ensure their place in the top 16. 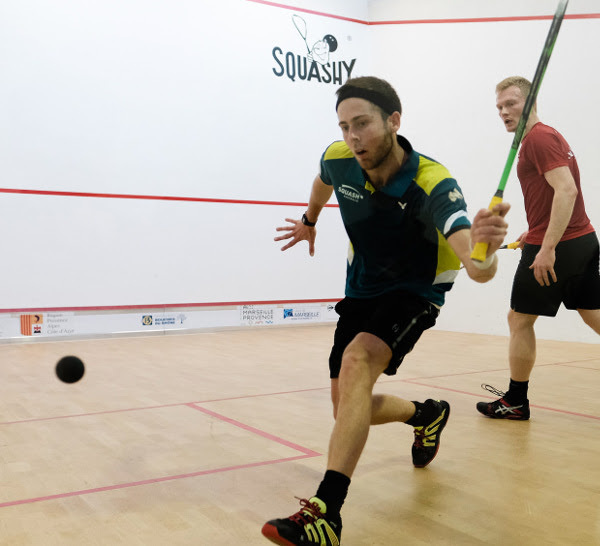 Number one Joel Makin put the 13th seeds ahead in the Pool D tie before Welsh second string Peter Creed beat Swiss Martin Svec (both pictured above) 11-7, 7-11, 11-5, 12-10 to clinch victory. 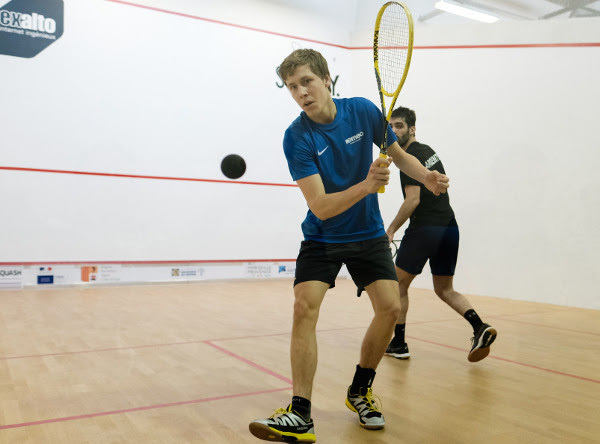 21-year-old event debutant Emyr Evans ensured maximum points with a straight games win over the 19th seeds’ Jakub Solnicky. “We have to prioritise which world team events we play and haven’t played this event for a few years,” explained Welsh national coach David Evans, a former British Open champion. 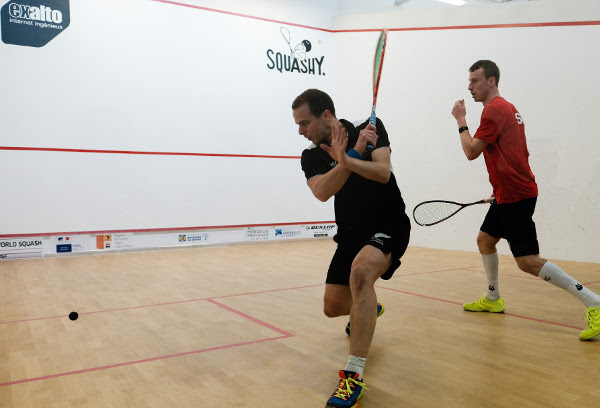 “But with Joel at his highest world ranking and Peter and Emyr both playing well, we thought we could do well here. And now we’ve achieved our first objective, which was to make the last 16. “The 3/0 score of our defeat to Australia yesterday doesn’t do us justice as it was very close. I’m pleased with today’s performance as it shows that we can back it up. After upsetting higher-seeded India in their opening qualifying tie, ninth seeds Malaysia confirmed their supremacy in Pool H when they beat Austria 3/0. But the 23rd seeds gave Malaysia a fright in the opening match when Aqeel Rehman twice led Nafiizwan Adnan, the Malaysian number one who 24 hours earlier stunned top-ranked Indian Saurav Ghosal to lead the surprise result. Adnan raised his game, however, to close out the match 8-11, 11-8, 9-11, 11-3, 11-4 before team-mates Eain Yow Ng and Addeen Idrakie also prevailed to cement Malaysia’s top 16 berth. It was in Pool G that 10th seeds Scotland confirmed their place in the elite knockout stage by defeating Jamaica 3/0. 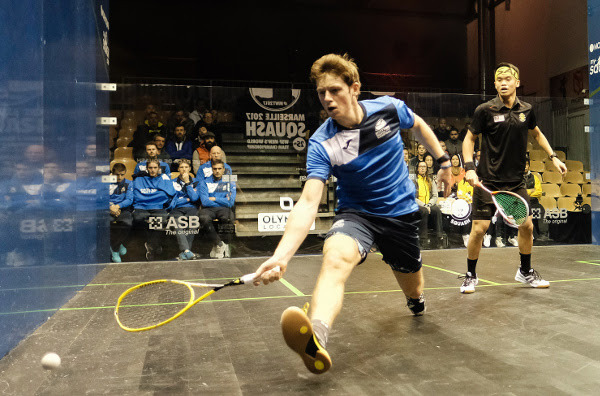 The Scots took no prisoners – Alan Clyne, Greg Lobban and Kevin Moran seeing off their opponents, all making their debuts in the event, in straight games. The win saw the Scots finish as runners-up to Germany, the No.7 seeds. “I don’t think it mattered too much whether we won or came second in the pool,” said Scottish team manager Martin Heath. “We knew we’d expect either Malaysia or India in the next round. “We have a strong squad and are looking for wins at every position. Jamaica, seeded 21, are appearing in the championship for the first time. Team manager Douglas Beckford said: “We were really hoping to get into the last 16, but in reality we knew it would be difficult and are now fighting for 17th place. We came in seeded 21 and hope to improve on that. “It’s been a tremendous event for us and we haven’t been overwhelmed at all: 3/0 scores can sometimes give the wrong impression! Finland survived the only tie decided by the third rubber when they beat 18th seeds Argentina 2/1. Olli Tuominen, the 38-year-old former world No.12 celebrating his ninth appearance in the championships, put the 15th seeds ahead when he beat Leandro Romiglio 11-9, 6-11, 11-9, 11-9 – but Argentinean Robertino Pezzota set up a decider when he beat Miko Äijänen in three games. It was left to older brother Jami Äijänen to clinch victory for the Finns, overcoming Juan Pablo Roude (both pictured above) 11-7, 11-7, 11-9. “We were definitely slightly nervous about this match,” said Finland national coach Tomi Niinimäki. “I watched Argentina play England on the first day and they were good. Winning today is a big relief – we are really happy to be in the top 16. “We have some good players coming through – the (Äijänen) brothers are quite young and will be here for a long time. We can expect a lot in the future. Seeded 14, Canada maintained their presence in the top 16 for the 22nd time since 1971 after beating Ireland 3/0. Team number one Nick Sachvie put the side ahead against the 20th seeds, beating Arthur Gaskin 11-7, 11-5, 9-11, 11-2 (both pictured below) before Shawn Delierreand Andrew Schnell wrapped matters up with 3/0 wins. “We knew we would be challenged here and had to be ready,” said Canada’s national coach Yvon Provencal. “Nick is playing his first worlds – and he is just fearless, and that’s great for the team to see. “Shawn was in the zone today so I knew we were OK. Andrew was in need of a good match and he had a good run. The final places in the top 16 were decided in the evening: 11th seeds USA confirmed their place by defeating South Africa, the 22nd seeds, 3/0. After Todd Harrity put the Americans ahead with a 3/0 win over Thoboki Mohohlo, second string Christopher Gordon put the result beyond South Africa’s reach after recovering from a game down to beat 45-year-old Rodney Durbach 9-11, 11-2, 11-7, 11-3. US team manager Paul Assaiante said: “The 1,2,3 playing order was good for us. Thoboki moves like a cat so we had to keep the pace high. “We were surprised to see Rodney at two: he has magical hands and is a wonderful competitor, and still plays a great game. But Chris dealt with him well. Durbach, the championship’s oldest ever participant who made his event debut 22 years ago, commented: “I felt good after the first game – I hit my shots well, it was nice. “I didn’t feel at all out of place. It was probably the length of the rallies that I wasn’t used to – back home they don’t last that long! “But I’m disappointed – I thought I could have done better. In the final tie of the day, 16th seeds Switzerland beat former champions Pakistan, the 17th seeds, 3/0 and will face defending champions England in a bid to reach the quarter-finals for the first time.